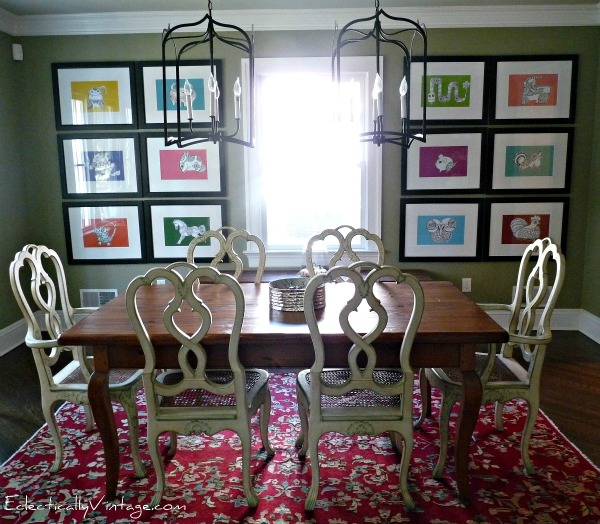 I’ve got big plans for my dining room so while I’m working on that, I thought it would be fun to take a trip down dining room memory lane and then share my plans for updating the room. This is what I had to start with when we bought the house eight years ago. 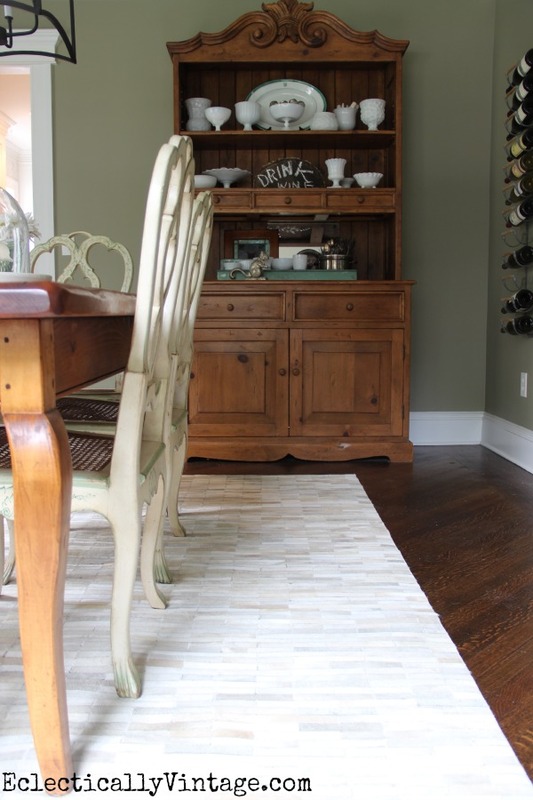 A nice size dining room and original hardwood floors is about all I can say about this space. A complete gut renovation helped and included refinishing the old floors in a dark stain, new paint, art and lighting and moving my existing furniture into the room. Can you believe the art is actually coloring book pages – they are the signs of the zodiac (I’m a Pisces and love walks on the beach and margaritas)! Money saving tip: instead of buying custom frames, have mats cut to fit ready made frames. I soon added a plate wall and my collection of vintage demijohns. Don’t miss my favorite find for hanging plates. My first update a couple of years ago was to replace the red rug with this pieced cow hide. I love how it lightens up the space! Next came this amazing industrial metal cabinet and the pine hutch took the place of the plate wall on the other side of the room. 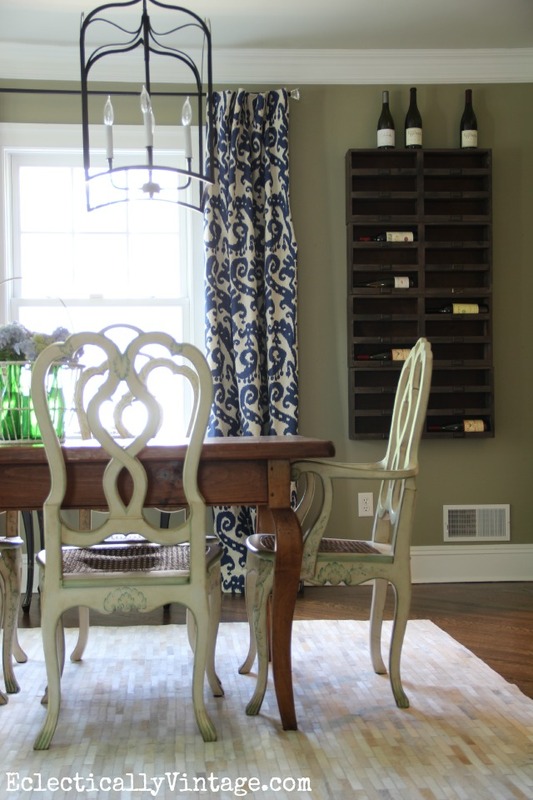 I wanted something more neutral so I removed the art and added these rustic wood wine cubbies. Soon after, the curtains were added. 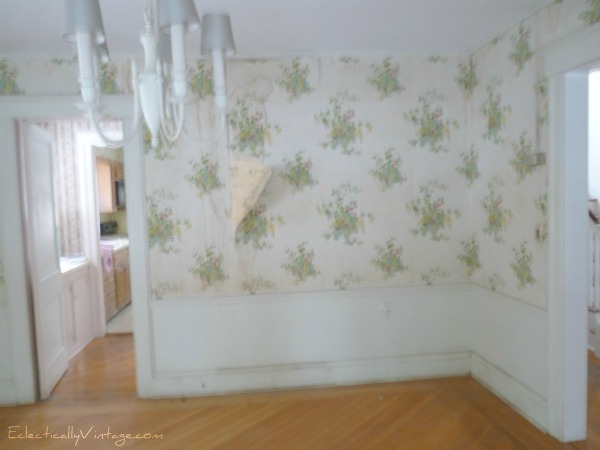 Paint – I desperately want to lighten the wall color. I’m leaning towards a soft gray. 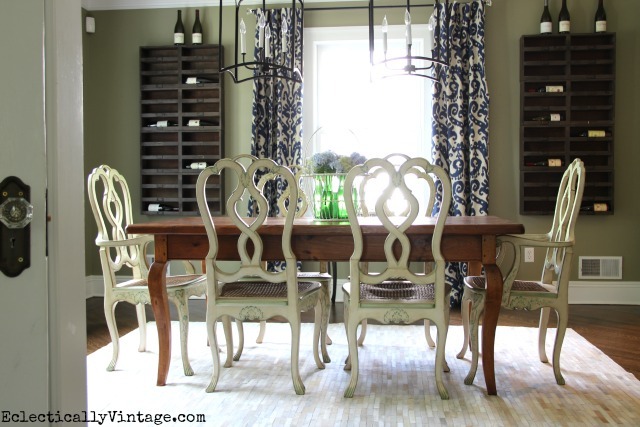 Chairs – my French country chairs are almost 20 years old and I’m ready for something simpler (plus the cane seats are starting to sag and I don’t want to spend the money to fix them when I can get something I really love). I’ve partnered with Lamps Plus and have been perusing their huge selection of dining chairs. 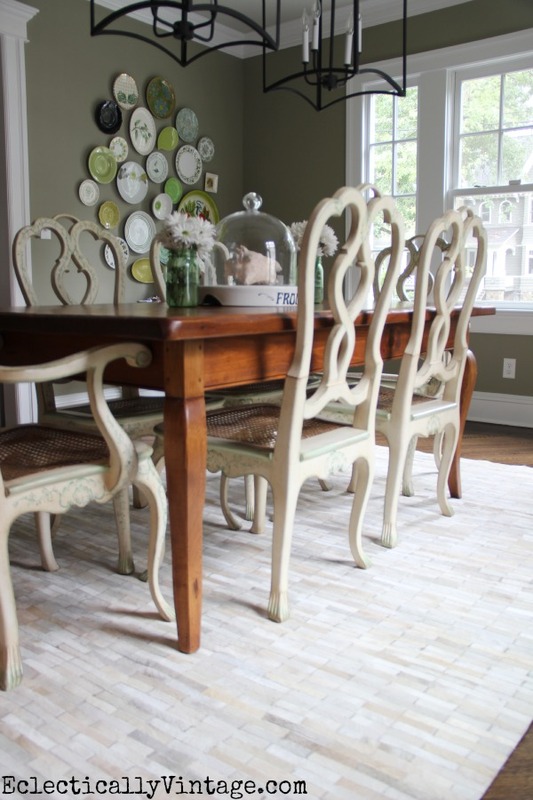 I’m thinking of four side chairs like these amazing rope chairs and then something different for the head and foot of the table like a pair of these linen nailhead chairs. Plate Wall – I miss my plate wall and since I already have the industrial cabinet in the room, I think the pine hutch can go and in it’s place add this vintage bar cart that is now in my guest bathroom. I’ll add a plate wall above. Curtains – I love these curtains but may remove them once the changes are made for a simpler look. 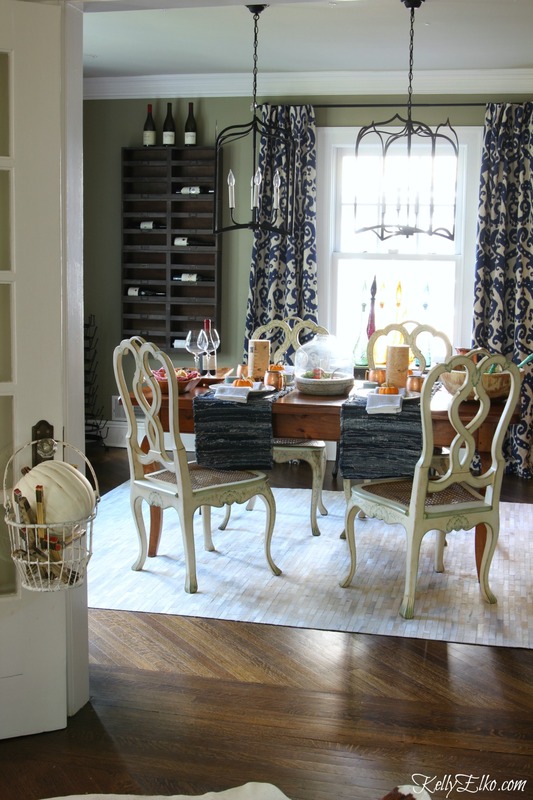 Here’s to gathering around the dining room table! I had red walls in my last house. I say do what you love – it’s just paint! I don’t care about color of the year (this year’s poised taupe is hideous)! Get a few samples and paint them on the wall, look at them in different lights and with the trim. I think that is the only way to choose the perfect color for your room. Good luck Susan! love where this is going and can’t wait to see it come together! I can’t wait either – want to come over and help me paint?! What a beautiful transformation. I love the color of your floors and the choice of chairs is going to be tough- both great! Happy Thursday! 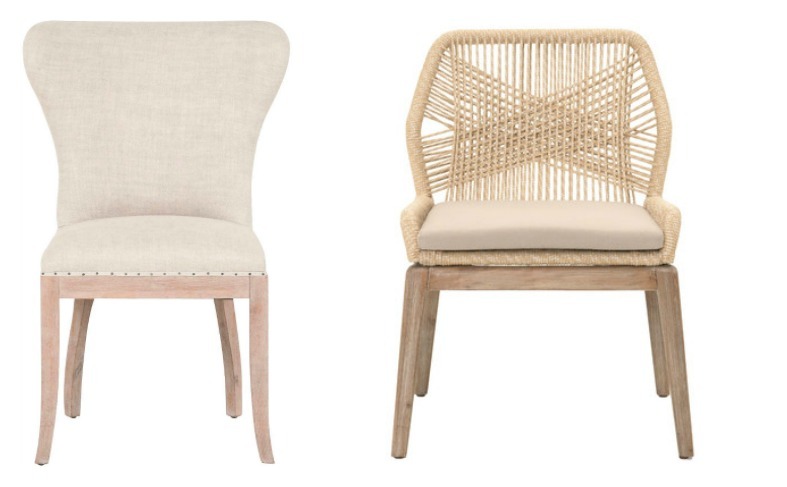 Thank you – those rope chairs are stunning! Happy Thursday to you too! Lovely room in all of its manifestations. What do you do with the loved pieces that you remove… The plates, the art, etc. ? I love to change things around in my home, and I love thrifting, but I want to keep all of it? Thank you Martha! I have trouble letting go too but since I don’t want my house to look like an episode of hoarders (which is sometimes does! ), I try to purge every so often. I had a garage sale a couple of years ago and list my stuff on Craigslist. That way, someone can get real enjoyment out of things I am over. For the rest of the stuff, I store things in my basement and switch things out seasonally. 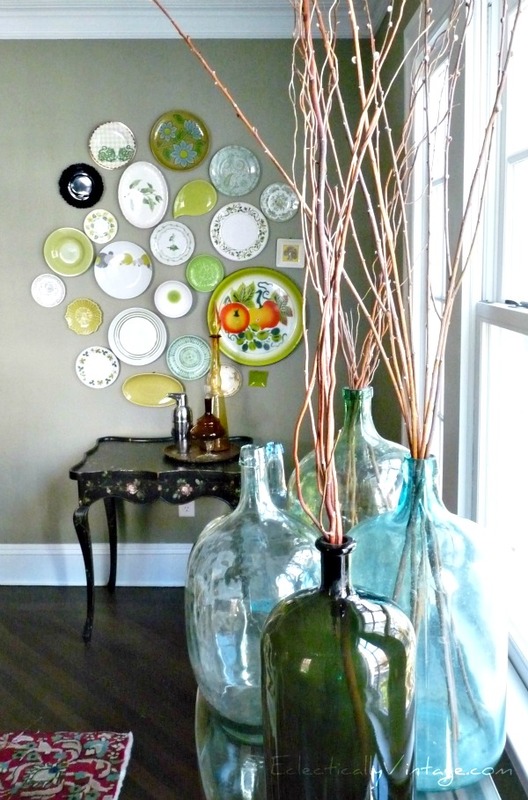 I have kept the plates because I knew I would rehang them one day and it was such a perfect assortment of plates! Sometimes we just have to let it go! Thanks Pat – I LOVE the rope chairs! Right now, the bar cart is in my guest bathroom and it’s as I found it. I love it that way and will probably keep it like it is. I have so many plates but too little wall space! Whoa. Very old and heavy decor. All those nicknacks are impossible to live with. Dust, dust and more dust. Now that I’m old(er) very obvious in terms of my energy level. Ha! If I could do a “do over” everything would be locked up! I do love the black steel & white wooden cabinets. Nice and big for necessary storage. The way I think now. definitely, less is more. Easier to live life downsizing. Very happy to know I am not purchasing anything these days. No no no. Would love for someone to help take all our excess away! Best of Kelly. I’m moving to the less is more camp too Marcee – it’s so hard when I have so many things I love but as I get older, I want less clutter! I totally get where you are coming from with the cane seats. It’s why I’m reluctant to keep a gorgeous set I found. It’s really evolved. Looking forward to seeing what you do! 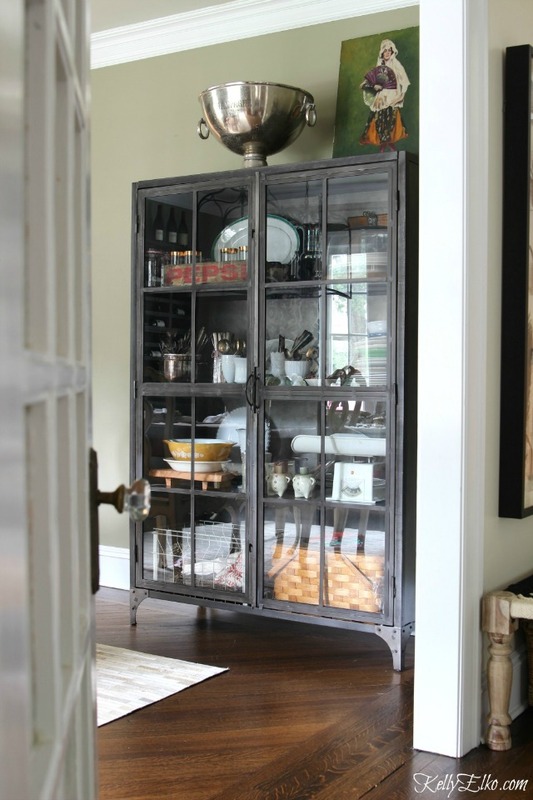 CAn you please tell me a little bit about your metal industrial cabinet in your dining room? it is really great! I have been looking for something similar for our mountain h home. CAn you share where it is from? Enjoy your blog Kelly!